Moving house often tops the list as one of life’s most stressful experiences, and Aussies are on the move more than ever before. 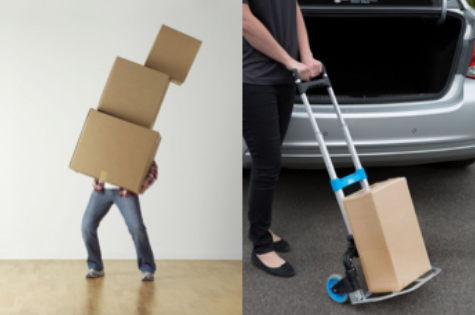 The Australian Bureau of Statistics states that 90 per cent of young households have moved at least once in the last five years, and 40 per cent having moved three or more times. “However, with the right equipment you can significantly decrease the cost of moving by doing some of it yourself, and with some careful planning,” he says. Start off on the right foot by putting your plans on paper. Create a detailed checklist and timeline that covers each stage of the moving process at least four to six weeks prior to moving day. Then give yourself a day to actually get all this important stuff done. This includes purchasing packing supplies, booking rubbish removal with your local council, updating your bank and transferring utilities to your new address, redirect postage, review your insurance policies, booking a cleaner and arranging the inspection day with your real estate agent if leasing. It’s also helpful to create an action plan for moving day and share this with your family to make sure everyone knows what they are each accountable for and you can work to tighter deadlines with the removalists (to help save costs), as well as help avoid any unwanted fines from unpaid bills that didn’t reach your new address in time. You can cut down costs by purchasing packing items directly from a supplier, such as bubble wrap, cardboard boxes, tape and marker pens, instead of getting the removalists to purchase it for you – as this will generally include an admin fee. Trolleys are also a vital piece of equipment in a DIY move as they enable you to easily move heavy loads safely. For example, the Kelso small or medium folding trolleys ($69 and $119) have 125kg and 150kg load capacities respectively, and can be folded and stored in small storage spaces in the car or home. They feature a lightweight, durable steel frame and flat-free poly-rim wheels to suit any home moving so you can leave only the largest of furniture to the professionals. Depending on what you’re comfortable with moving, the Kelso large folding hand truck is specifically built for moving large furniture and white goods over staircases in a safe and reliable manner to help you save even more on professionals. It has a 250kg load capacity, 8inch flat-free wheels, folding ergonomic handles and a lightweight aluminium frame for extra strength – and can still be folded for easy storage. Start to prepare your current home at least four weeks prior to moving day by getting rid of things you don’t need, as this can also help you make money. By de-cluttering early, you can look to sell any good quality items online before moving day, rather than throwing it away at the last minute. Start in the garage or storage spaces where you are more likely to have unwanted items. Also start to use up the food in your freezer and food items that will reach their use by date by the time you move to avoid unnecessary waste. Carry out any maintenance or required repairs at the property so that it’s in good condition when you leave. This is especially important for renters who will need to cross-check with a condition report, as one in eight renters surveyed have lost their bond due to insufficient cleaning and rental arrears. Pack lighter items into large boxes and heavy items in small boxes. This helps keep the weight of each box more manageable, making it easier to pick up and load onto trolleys, as well as preventing injuries to your back. Be resourceful when packing by making use of things like socks, towels and blankets to securely wrap small or fragile items. This will not only save you having to pack them, but also help reduce costs on bubble wrap. Moving day will creep up faster than you would have liked, but luckily you have your action plan to refer back to. It’s best to start early on moving day to get the most out of the daylight hours. Load the truck with large items first, such as mattresses, washing machine, fridge-freezer, and then boxes. Load your kitchen boxes last so they are first into the new home to help prevent food spoilage in a hot vehicle. It’s also a good idea to place boxes straight into the corresponding room in your new home for easy unpacking once everything has been unloaded. Kelso hand trolleys are available in independent hardware stores, including, Mitre 10, Home Timber & Hardware, Independent Hardware Specialists, Vetner and Trade Tools.